As I have read, a dedicated pair of riding boots is usually the last piece of gear that riders purchased. I certainly fall into this category. It's been three years since I became owner of my SH and finally purchased some moto boots. Shortly after getting the SH I ordered a pair of TCX boots, don't remember the model, but it was lower end price point. I was disappointed in the perceived quality. I sent them back. I might have kept them if the fit had been close, but no cigar. If you have a high volume foot these might work for you. Not me. I have a somewhat wide (D width) foot, but not shaped like a loaf of bread. Sasquatch would fit in a boot like this. The other negative, in my opinion, was the marginal look and feel of the synthetic "leather". Overall that model TCX didn't strike me as that great a boot. As the saying goes, you get what you pay for. and this one: https://shop.helimot.com/shopping/shopexd.asp?id=69 which I didn’t know was in the sub $400 range when I bought the A*s. I must have had this model mixed up with the Gore-Tex version, which is close to $500. Too bad as this boot looks to be very, very nice, and the one that would have fit the bill perfectly. I found myself gradually going up the price ladder as I read the reviews of all the boots I researched. Trying to find the boot that had all the features, fit, finish and look that I wanted. "Look" brings up another item on my list of features that seemed important to me. Most of the big name brands have that power ranger look, especially at the upper end of the model lineup. This was not something I really wanted, which made the whole search process that much more difficult. I reached my limit on searching and looking and bought a pair. About 6 weeks ago I found a deal on A* Supertech R boots. Alpinestars Supertech R Boots | MotoSport I purchased the red/black. Wanted all black, but only the red/black was in my size. I thought that $349 was a good price for this level of boot. These normally retail for $449. Close to perfect. With a slight bit of extra room, I'll be able to fit heavier socks for cooler weather. I have also read that in the smaller sizes that they run a bit big, as much as a full size. Quality of materials and construction are first class, again I wonder how the "synthetic leather" will hold up long term, or in a get off. It is not very thick and overall durability is a question mark in my mind. This issue is probably just in my head as the boots are intended and sold as track capable. I also read a review about the strap and ratchet on the calf area detaching it's self. Because of the boots internal bracing system and the replaceable red bits on the outside of the boot, I think I'll be able to tone them down to my modesty level. After using them a few weeks I grown more comfortable, that is less self conscious of the racer look. One thing is certain is I feel like my feet are well protected. That piece of mind is worth whatever the imperfect fashion statement is. These boots are truly comfy. The inner bootie works well to cradle your foot. It’s like a big pair of bedroom slippers. The bracing on the outside of the bootie does not intrude or press against your foot when the outer boot is slipped on. The whole package works very well on the comfort side of things. I was very surprised. It’s apparent that a lot of good engineering went into the design of this boot. I’m not one to go somewhere and spend a lot of time walking around, but you could do it in these boots. While slightly ski bootish they are not so much as to make walking difficult of uncomfortable. That said they are not your favorite pair of tennis shoes. Only a few shifting misses as I got used to the different feel. After adjusting the position of the shift lever and more riding things are working nicely. The feel of the bike on the pegs and controls comes through the boots well without being over intrusive. The soles are quite grippy. They seem to hold well on a verity of surfaces. Having not been in the rain with them, that remains an unknown. Overall I’d say it’s an outstanding piece of kit and I look forward to putting lots of miles on them. I have two pairs of boots, both fairly "inexpensive". One pair is a half boot from Cycle Gear, comfort is okay, but they're easy on, easy off due to the dual zippers on the front. I love that easy access. I think they need sole inserts to be more comfortable, but other than that, they're great. I can wear them at work all day and be fine in them (office job). I would recommend this boot to anyone looking for a daily boot that doesn't stand out. The others are ricky racer boots i picked up on sale at CG, and they too have the "ski boot" stance. Not bad, but noticeable. When I wear them with leathers, the leathers go inside the boot. When I wear them with jeans, I wear the jeans over the boot, and it helps tame down the boy racer look. I don't think I'd want to walk far in these boots, but I've only worn them a few times. It's either these, or something very close to these. The were on sale for around $40, so I jumped on it. Across town or muilty day rides with lots of stops .. Walking in them is ok unless really hot, and still ok, just HOTTER then wearing vented shoes. The Torque out boot was one I had considered early on. I really like the idea of the rear zipper. Easy on and off. I was concerned that the width would be an issue as many of the reviews I read made mention of Dainese boots running on the narrow side. I would like to be able to try on a lot of different boots, but alas, I live in the hinter lands with very limited selection. How would you judge the width sizing on this boot? Just sent back a pair of TCX S-Sportour. They weren't wide enough for my 4E "Hobbit" feet. Anyone know of brands that run in my width range? And for those on a budget (like me) if you know your sizes you can get some pretty screaming deals on lightly used name brand stuff off ebay and craigslist. Lots of people wear something once or twice and it sits in the closet until they sell it. Last edited by captainchaos; 10-11-2013 at 08:40 PM. You may be in for a long search. All the reviews I have read have the TCX line of boots as the best for wide, high volume feet. 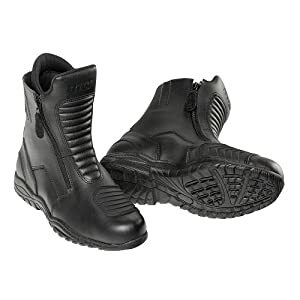 Try here http://www.vitessemoto.com/boots/glove.php They will semi custom make a boot for you. I have a pair of A-star SMX Plus boots, aka the squeekers, for racing and street riding when I wear my suit. They are very comfortable riding and walking, but don't blend in well for when not riding. I have some hiking boots I wear when I'm street riding my XT, but they're getting ragged and I'm going to start looking for a replacement street riding boot soon.